Normally there are three bullfighters and six bulls in the programme. Each bullfighter has two bulls. Each bullfighter has a Cuadrillo (Team of men) to assist him in the ring. Firstly there is the procession of participants. When the bull first enters the ring he is caped to see his reactions. There are three acts to the fight with each bull. 1. The act of the picadores. 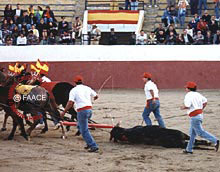 The damaging of the muscles of the bulls necks with the pica, a spiked lance. 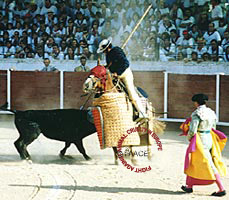 This is done by the picador, a man mounted on a horse. The horse is blindfolded, has his ears stuffed with wads of newspaper and on occasions has his vocal chords cut. The horse is covered with padding. 2. The placing of the banderillas. Up to six banderillas or harpoons are allowed. These have a 5cm metal end with a sharp point and barb. 3. 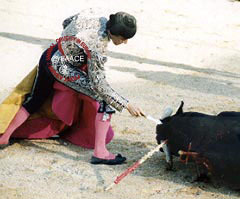 The matador uses the muleta (red cloth and stick) to make a few passes and then with a sword he attempts to kill the bull. If he fails, he then uses an Estoque de descabellar (sword with a crosspiece near the point that turns the end into a stabbing knife), with which he attempts to sever the spinal cord behind the head. 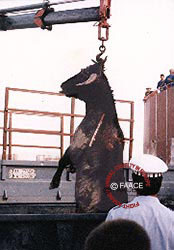 Then the bull's spinal cord is finally cut through with a puntilla (stabbing knife). 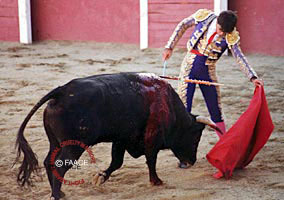 The ears and sometimes the tail are cut off and awarded to the bullfighter and the bull is dragged out of the ring. 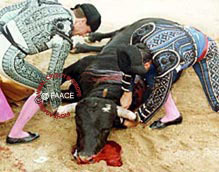 When all has been done to kill the bull some are still alive when they leave the bullring. 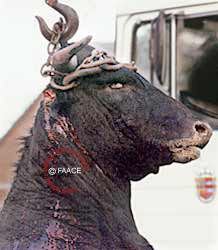 With ears and tail removed, this still living bull was finally killed, outside the ring, in the back of a lorry. In Spain, where prior to the eighteenth century the whole form of the bullfight had been mounted, the part of the horseman diminished to that of the picadors' act only. In 1923, a cavalry officer Antonio Canero revived equestrian bullfighting, which at first was practiced only among enthusiasts and not professionally but eventually most turned professional. 1. Sticking in rejones (spears, in Spain), the actual blades of which are between 25 & 35cms in length or farpas (spearheads, in Portugal, 25cms). Up to three of either are used. 2. Placing banderillas, with one or both hands and with long or short sticks.. Up to six are used. 3. Killing, or attempting to kill (in most cases), with a sword. 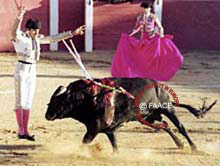 This form of bullfighting exposes the person to hardly any danger. Portuguese bullfights always advertise that they do not kill the bull. What they should say is "We do not let you see us kill the bull". 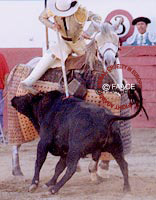 The farpas have barbed spearheads approximately 25cms in length, which are left embedded in the bull's shoulders plus the sharp harpoons (Banderillas). 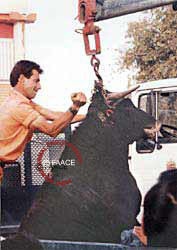 The bull is then physically manhandled and held for a few moments then released by a team of Forcadas (eight men). The bull has to be killed because it would die anyway. To say the bull is not killed is just a cynical ploy to try and get tourists into the bullring and take their money from them.